Any swimming pool would be nothing without a pool liner. The purpose of a swimming pool liner is to create a waterproof container for you to swim in. Pool liners are often made of vinyl, which can be quite durable; however, in sunny climates like California, vinyl swimming pool liners only last about 7–12 years. You can tell when your pool liner will wear out because you will see cracks that must be patched if you are delaying the inevitable pool liner replacement. This effect is from heat and abundant sunshine. To protect the swimming pool liner from sharp rocks, vegetation, and other external influences, a layer of padding is usually installed first, often made of foam. You should always be careful about the items you allow inside your pool as well, as punctures or damage to the pool liner will result in leaks. 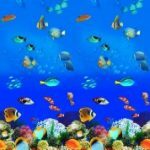 Swimming Pool Outfitters offers several high-quality pool liner and liner pad products. Browse our selection on our website to find the perfect solution for your swimming pool today. Our premium liners are constructed of Standard and Heavy Gauge vinyl, our liners will last longer and maintain their beautiful appearance for years. Strong, double-welded seams will withstand winter’s worst. Our liners are so rugged; they are backed by a 15-Year Warranty on Standard gauge liners and a 25-Year Warranty on the Heavy gauge. New Liner Pad makes old foam floor padding obsolete. Unlike foam, which can be easily cut by grass, roots or rocks under your liner, Liner Pad protects your liner from sharp objects. Liner Pad is tough, but also adds a layer of cushioning. 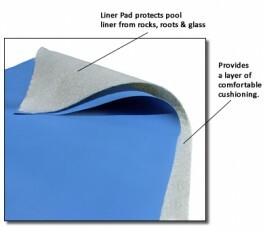 Liner Pad is cut to size and seamed for your pool. No more cutting and taping as with foam. Virtually eliminate vinyl liner bottom leaks with Liner Pad.